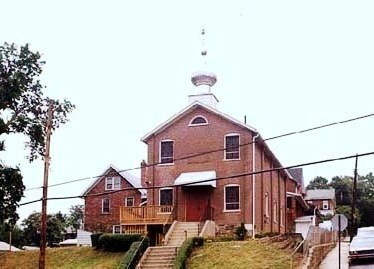 St Nicholas Orthodox Church is located in Coatesville, PA, Chester County, approximately 40 miles west of Philadelphia. Exit Route 82 south to Coatesville. Stay straight at traffic light (1st St). Church is 4 blocks south of the light on the left hand side (Oak St). St. Nicholas Church in Coatesville was organized in 1915-1916. At that time, the Worth Brothers operated a steel mill and many young Russians came in search of work and settled in Coatesville. The nearest Russian Orthodox church was in Philadelphia, so the people decided to establish their own parish. A number of these people moved away over time to seek employment elsewhere, while others stayed and struggled to maintain the parish. Fr Semashko was the first parish priest assigned by Archbishop Evdokim. In 1917, a plot of land was acquired by the parishioners to build a church, and in the same year, the church was completed and dedicated to St Nicholas the Wonderworker. Prior to this, services were held in a building next to the railroad station on Third Ave. Archbishop Alexander consecrated the church. Shortly after the new church was built, four acres of land west of Coatesville off of Route 30 were purchased to be used as a cemetery. Mr Dimitry Babich built a chapel there with the help of other parishioners. He also made the cross which rests on top of the cupola. In 1957, VRev John Morozoff was assigned to the parish. He is remembered for remodeling the iconostas. New icons on the iconostas were painted by the artist Serge Sokoloff. Through the generosity of many people, the windows, icons, vessels, carpeting and other items have been donated. The original chandelier with genuine crystal pieces is still hanging in place providing light and beauty. The original bell, which was donated by the early founders, is also still in use. Many priests have served this parish since the early days when the church services were conducted in the Slavonic language. We remember the past and are grateful for the many sacrifices our founding fathers made for us so that we may worship the True Holy Orthodox Christian Faith, while at the same time, we leave it behind now and build into the future. Our services are now conducted in the English language so that our children can participate with understanding and become a part of the heritage their great grandparents left them. On Sunday, October 1, 1966, the parish celebrated its 50th anniversary. His Eminence, Metropolitan Ireney, Primate of the Church (Metropolia) and His Grave, Bishop Kiprian celebrated the Hierarchical Divine Liturgy. They were assisted by twelve priests and the parish priest, VRev Joseph Oleynik, who also celebrated his 50th Anniversary of ordination to the Holy Priesthood. For the most part since the 60’s, a number of priests served this parish for a short term, with the exception of Fr Dimitri Voytilla, who served from 1986 to 1995. This made it difficult for the parishioners to adjust and to accomplish the various church programs, yet they kept their fath and worked together to keep this parish together. These were difficult years, but the work got done. Throughout the history of the church, there has always been a church choir. In the 1930s, the choir also served as a social outlet where the members gathered together and planned events and visited other churches. This is not so today, but there is still a choir, under the direction of Nina Petro, whose mother had also served as choir director. The younger children are coming to church and attend church school on a regular basis. Classes are held in the church hall throughout the year; there is no summer vacation! Our church school was established in 1956 by Mrs Anna Ruszhak and Mrs Georgette Sarosi. This was a period when the parents became involved to teach their children the Orthodox faith. The church school is still growing in membership to teach the children enrolled. Today, like their parents, the children of the 50s are now teaching their own children.